Come join us for Tuesday and Wednesday night Bingo games at the Knights of Titusville, FL. We are NON-SMOKING throughout the building. We have 2 10-minute intermissions to allow our smokers to step outside for a smoke break. 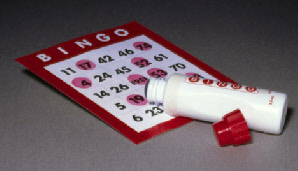 We have 31 games in all for regular bingo these include 3 $250 jackpot games. Regular game payouts are at $50 per game regardless of the number of players. In addition to those games we have 2 special games at 6:00 pm, which pay $175.00 and a “SHAMROCKS” game after the 2 nd intermission that pays $130. We also run pull tabs for additional possible winnings. The games start at 6:30 but the doors open at 4:30 and we hope you will come on by early and socialize with your fellow bingo players, most of whom chat and play card games before Bingo. Our kitchen is open before bingo and during the first intermission. We also sets up complimentary coffee stations for you all to enjoy at the intermissions. If you want to have a beverage, we have a lounge that opens at 5:30 p.m. where you can grab soft drinks, water, candy and various chips. We serve both Coke and Pepsi products. *Each package is plus $2 to play our optional bonus game. Once again, we hope to see you here at 6:00 p.m. for our early bird games to be followed by regular bingo at 6:30 p.m. on Tuesday and Wednesday nights! Support the Knights and support charity!